During a two-month test campaign, the scientists from Fraunhofer IWES will be determining in the Dynamic Nacelle Testing Laboratory (DyNaLab) how the nacelle of a 3 MW wind turbine from ENERCON reacts to grid faults. Turbine components which are not physically present on the test bench are represented by models with various levels of detail. Their impact on the results is examined within the scope of the CertBench research project. 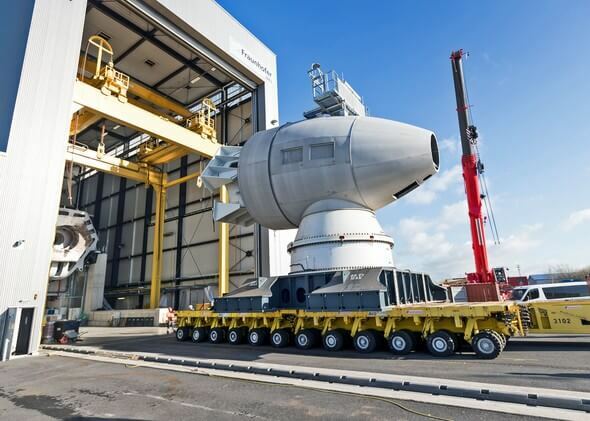 Following on from the test in Bremerhaven, a further test campaign is scheduled to be performed by the project partner RWTH Aachen. It will then be certain to what extent the electrical turbine properties determined in the field test concur with the results from the laboratory test. The equivalent recognition of test bench tests for certification can accelerate the development process considerably and also simplify the market launch. To date, measurement data from field tests have been used to certify new wind turbine types. As part of the CertBench project, the project partners aim to prove that typical grid faults such as voltage dips and frequency fluctuations can be reproduced just as realistically on a system test bench. In an artificial grid, certain network faults can be generated as often as required “at the touch of a button”. This, in turn, means the certification requirements can be met in a well-planned manner. This results in significant time savings for manufacturers. 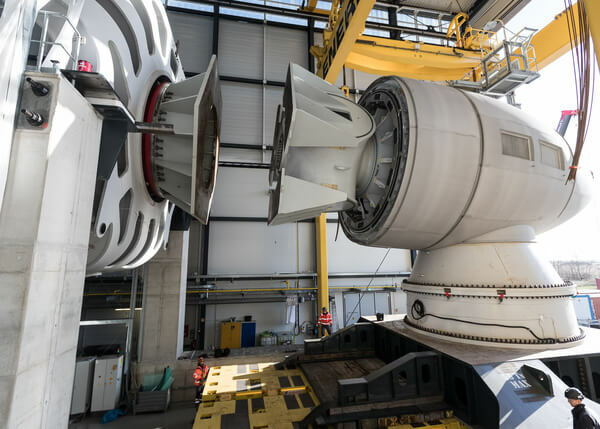 Realistic loads and interactions between the nacelle and rotor will be simulated using real-time models and control algorithms on the test bench for hardware-in-the-loop (HiL) operation. The nacelle is the real hardware on the test bench whilst the rotor is simulated virtually, and the torque is calculated from the flow during testing. This value is used as set point for the test bench drives and their feedback is lead back directly into the rotor model. This way, the rotor can be realistically simulated. “The complete wind turbine can be tested in HiL mode although only the nacelle is set up on the test bench on site. Accordingly, only minimal adaptations to the turbine control are required”, explains Dr.-Ing. Tobias Meyer, nacelle testing project manager at Fraunhofer IWES. The rotor model is set up using the MoWiT software which was developed exclusively by Fraunhofer IWES. This is, for example, capable of simulating the elasticity of the rotor blades of a wind turbine with a varying number of degrees of freedom during different test runs. In this way, the degree of modeling accuracy required in nacelle testing to achieve sufficient results is determined – additional details require additional computing power. To accelerate the development process even further, the MoWiT rotor model can be derived from “Bladed” models widely employed in the wind industry. The nacelle for the CertBench project is tested on the system test bench as per the technical guidelines for determining the electrical properties of FGW (association for the promotion of wind power and other forms of decentralized power). The nacelle from the project partner ENERCON has already passed field measurements for its certification. This allows direct comparison of the results determined on the test bench with the available field data. Consequently, validation of the test method becomes possible. "In order to generate an industry-wide acceptance of system test benches as a recognized test facility of WEC, the current campaign will set a significant milestone," said Heiko Röttgers, project manager in the CertBench project of Wobben Research and Development GmbH. Should it be demonstrated that the electrical properties of a wind turbine can be determined on the test bench with the same degree of accuracy as during field measurements, this would have far-reaching consequences for the certification practice. The project partners will communicate the results from CertBench to the relevant bodies for standards and guidelines. In the medium term, this is already creating the possibility of shortening the certification process considerably. Fake News from the President! ORE Catapult’s third Research Hub will focus on the development of next generation turbines, improving their operation, reliability and performance.